One of the reasons I love Detroit is that there really is a lot of interesting things going on practically every day. Sometimes being in the right place at the right time allows you to see or experience something new, and Sunday was one of those right place at the right time moments. I was trying to capture some video of the Good Year blimp but wasn't having much success. The cloudy sky and not quite being able to position myself in the right spot at the river front or by the Ren Cen just added to my frustration. As I was filming though, I heard the beginning notes of a song from a bagpipe. I stop filming and turn around to see a guy decked out in a kilt with a bagpipe in hand. Definitely not your daily occurrence in downtown Detroit. I ask him if he is going to be playing a concert and gesture toward the Ren Cen. He tells me no but that he will be leading a procession to place a wreath at the statue of George Washington that is located in front of Mariners Church. He tells me he is a Mason. I quickly realize that Monday is Washington's Birthday and connect the dots to the wreath ceremony to honor the first president George Washington. 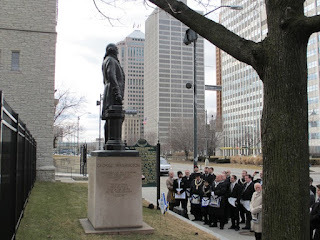 Not knowing much about Masons, I wasn't sure if they would all be wearing kilts (they weren't), but I did learn that the first president of the United States was a Mason, so it made sense for them to place the wreath at his statue. One of the Masons did a brief reading from a book as part of the ceremony, and then it was over. Life in Detroit - there's always something going on. Your posts never seem to lack interest and insight to what is going on in Detroit. You being out and about allows you to see and capture life in the Motor City. Life in the most positive way. The mainstream media is too busy doing their negative stories. You are an outstanding reporter. Of all my newsletters that show up in my inbox yours is one that I just can't wait to click on the DVD link because I know I'll find a slice of the Motor City that I can't find anywhere else. Glad you are enjoying the posts! All big cities have their share of negative stories, and Detroit has them too. Unfortunately, it seems like the negative ones are the ones that get the most attention. Our city isn't as bad as the popular media often portrays it. Thanks for reading the blog! This blog is a great way for MI west-siders to gain positive insights into the "forgotten" Detroit. Yours is a great service to the city and state, Roger. I'm encouraged to visit the gems you describe.